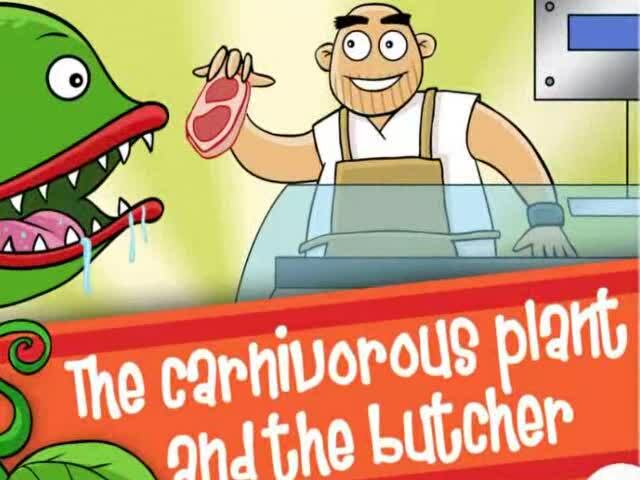 The Carnivorous Plant and the Butcher. Short animated story narrated in American English. Flora was a carnivorous plant, but truly in the meat-eating sense. She lived in a supermarket, next to her friend Porky the butcher's counter. Porky treated her with great affection and attention, and always had some morsel of meat to give her at the end of each day. But one day, Flora didn't get her ration of meat. Nor the next day, and she got so worried that she decided to spy on Porky. "Don't even think about it, Flora! Don't ever think about touching the meat in that box". The next morning, when Porky arrived and discovered the theft, Flora felt terrible. He asked her several times whether she had taken the meat. At first she denied it, but seeing Porky's worry and nerves she decided to confess. "What have you done? You reckless thing!" Porky exploded, "I told you not to touch it! All that meat was poisoned!! That's why I haven't been able to give you anything for days. They sent us a spoiled delivery..."
Without delay, they found a Pharmabotanovet, with a Greenhouse-hospital, who managed to save Flora's life. She was already feeling great pain in her roots, and her leaves were changing colour. The shock hit everyone hard, but at least Flora learnt to stick to the rules set by those who most love us. That's much safer than just doing whatever you want.